Finally, the zombie apocalypse has been quantified. A group of Canadian researchers have presented a sophisticated mathematical analysis of typical zombie attack scenarios. Why would professionals attempt a treatment of this (fictional) problem? This is, perhaps unsurprisingly, the ﬁrst mathematical analysis of an outbreak of zombie infection. While the scenarios considered are obviously not realistic, it is nevertheless instructive to develop mathematical models for an unusual outbreak. This demonstrates the ﬂexibility of mathematical modelling and shows how modelling can respond to a wide variety of challenges in ‘biology’. First, of course, you must define your terms. What kind of zombies are we concerned about? Not those merely historical zombies. Modern zombies (the ones illustrated in books, ﬁlms and games) are very different from the voodoo and the folklore zombies. Modern zombies follow a standard, as set in the movie Night of the Living Dead. The ghouls are portrayed as being mindless monsters who do not feel pain and who have an immense appetite for human ﬂesh. Their aim is to kill, eat or infect people. The ‘undead’ move in small, irregular steps, and show signs of physical decomposition such as rotting ﬂesh, discoloured eyes and open wounds. 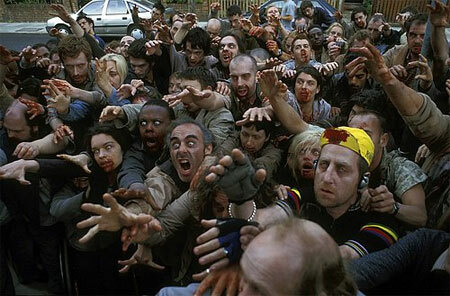 Modern zombies are often related to an apocalypse, where civilization could collapse due to a plague of the undead. I think that the zombies in the recent film Shaun of the Dead meet the criteria. They examine all of the usual scenarios; latent infection, forced quarantine of infected individuals, impulsive eradication models, the creation of a treatment or cure. Their conclusion? From When Zombies Attack! : Mathematical Modelling of an Outbreak of Zombie Infection via Wired. Thanks to Moira for pointing this one out.